The Russian speedskaters team did well in individual events, but the coach now has to focus on strengthening athletes’ performances in team events. 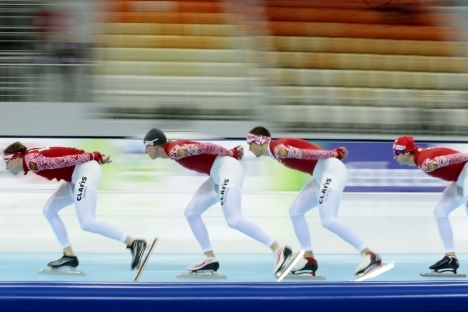 Russian speedskaters won five medals at the Sochi, single-distance world championship, with their haul of medals second only to that of the Dutch competitors, who set the pace in the event. The Russian team did well in individual events, but the coach now has to focus on strengthening athletes’ performances in team events. Denis Yuskov (men’s 1500-meter) and Olga Fatkulina (women’s 1000-meter) added two gold medals to the Russian team’s total. These individual wins were the first in 17 years for the Russian team at the world single-distance championship in speedskating. Thanks to the efforts of Ivan Skobrev, the Russian team also won two bronzes in the 1500-meter and 5000-meter events. Olga Fatkulina added a bronze in the 500-meter to her 1000-meter gold. Dutch journalists and top-flight speedskating stars were complimentary about the Russians’ performances, which were a big surprise for them. Russian sports officials also paid tribute to the Russian athletes’ successes. “I’ve been saying for a long time that a new generation has emerged in Russia, after the years of disappointment and failure that we’ve had,” said Svetlana Zhurova, distinguished speedskater, 2006 Olympic champion and current member of the upper chamber of the Russian parliament (the Federation Council). “This is the result of the work we’ve done over the last three years,” Alexei Kravtsov, president of the Russian Skating Union, said. The champions themselves find it hard to believe that they have become the best in the world in their events. “Being champion now and being junior champion – it’s like chalk and cheese. I still can’t believe it’s happened. I was reckoning on a podium finish, but never thought I’d win. I tried to imagine myself as world champion after Denis Yuskov won, but I couldn’t, and I still can’t,” said Olga Fatkulina. It was already clear after the first part of the cup season that the team had achieved a significant improvement in its results, and people have been saying all year that the priority events for the Russians are the team races. To the disappointment of the coaching staff, the team won no medals in the team events. The men’s team finished fourth and the women’s finished fifth. Russian athlete Olga Graf believes the Russian women skated well, but not fast. The team’s head coach also asked people not to jump to conclusions regarding the lack of medals for the long-distance skating team, which is working under the direction of the Italian coach Maurizio Marchetto. “These things can’t be rushed. We need to study all the nuances and then draw conclusions. It’s something for the coach and the competitor to analyze together,” said Poltavets. The world single-distance championship was the last international competition of the season for speedskaters. They will start the next season – the Olympics season – with a world cup stage in Calgary, Alberta. The article is first published in Russian at R-Sport website.